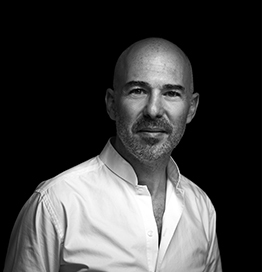 Former student of the Ecole Nationale Supérieur de Création Industrielle (National School for Industrial Creation), Elie Papiernik is the artistic director of centdegrés, the independent creative agency that he co-founded in Paris in 1988 with his friend David Nitlich. Brand intelligence, brand and style platform, visual identity, product and graphic design, merchandising, scenography, retail design, architecture, digital brand activation and video production presence: the agency is recognized as one of the most important for its expertise in the field of beauty, luxury and with beautiful brands, those that create strong emotional bonds. Present on the international stage from Paris to Hong Kong, China, where she opened four agencies, Ho Chi Minh, Bangkok, Seoul, Sao Paulo, Casablanca, Dubai, Madrid and Geneva – centdegrés combines deep reflection, anticipation and action to “think far, do well”. Passionate about brand transformation, ground-breaking innovation, collective intelligence, Elie Papiernik regularly intervenes on subjects including the future of retail, the digital revolution, consumer experience and storytelling for large groups and in international shows like Luxe Pack, Cosmoprof, Salon du Luxe, INSEAD program and the China Beauty Expo.